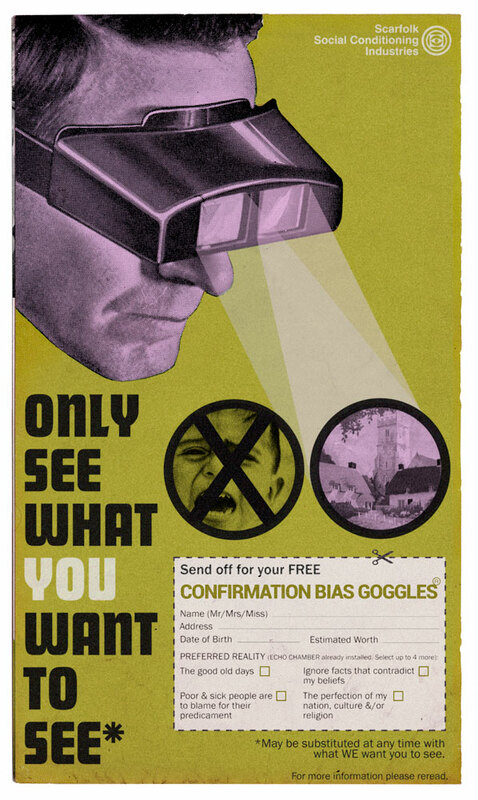 Confirmation Bias Goggles were the first wearable technology to be wired directly into the brain. In addition to the pinhead-sized speaker which perpetually broadcast the statement 'Of course you're right!' into the auditory cortex, the goggles' sensors could also switch off those parts of the brain that deal with troublesome emotions and feelings such as empathy, decency and healthy scepticism. By tapping into the wearer's biases, the goggles literally deleted undesirable objects from the wearer's field of vision. Sights that were too dominant to be erased completely were visually falsified to validate the wearer's preconceptions. By 1971, the state had adapted the goggles for use in schools. Children were told precisely what to think and what their personal opinions as adults would be. Unsurprisingly, everybody who tried the goggles, without exception, thought that they were a great idea. See also: De-education classes, Rub-on transfer newspapers, Mindborstal drug, The Fact Ban, and Children & Hallucinogens: The Future of Discipline. 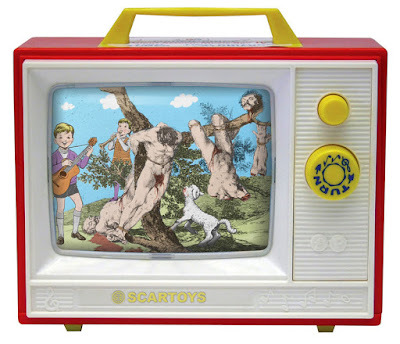 In order to prepare children for adulthood, parents in Scarfolk wanted to familiarise their toddlers with life's cruelties as soon as possible. Toy and game manufacturers were only happy to oblige. 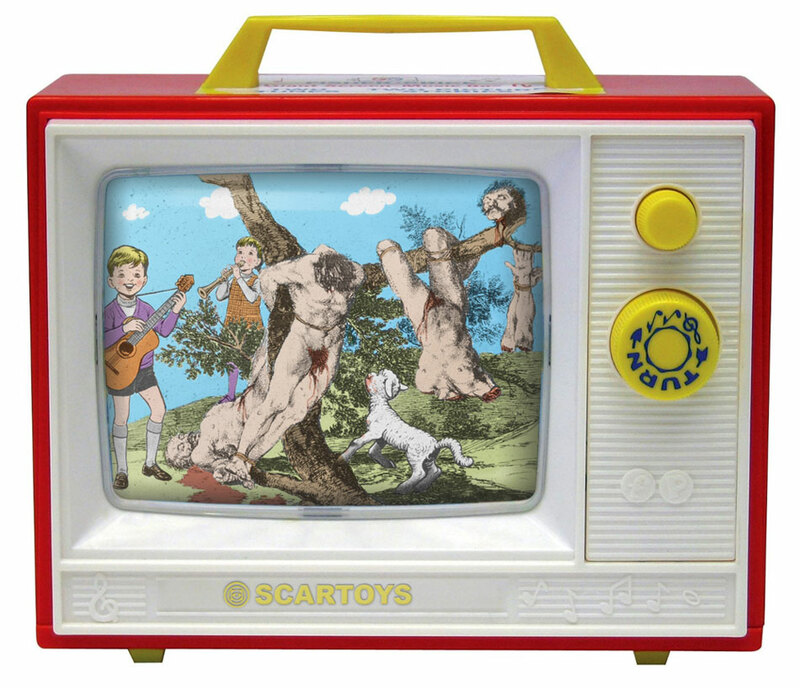 ScarToys' Sing-a-long-a-Savagery Music Box TV (see above) contained gruesome images of decapitation, dismemberment and disembowelment by artists such as Goya, Caravaggio and Hieronymus Bosch. The images were accompanied by nursery rhymes such as Girls & Boys Come Out To Maim, Mary Had a Little Laceration, and Wrinkle, Wrinkle, Little Scar (See Discovering Scarfolk p. 159 for more details). Additionally, children were forced to endure a variety of traumas they might typically face as adults. These included peer-group rejection, physical and mental degeneration (achieved with regular bleach injections and a cricket bat), and being hunted by the official Women's Institute sniper. For more toys and games see: The Drowning Game, Mr Liver Head, Pollute, Mr Smug, Landmine, Action Man Waterboarding Playset and Lung Puppy. 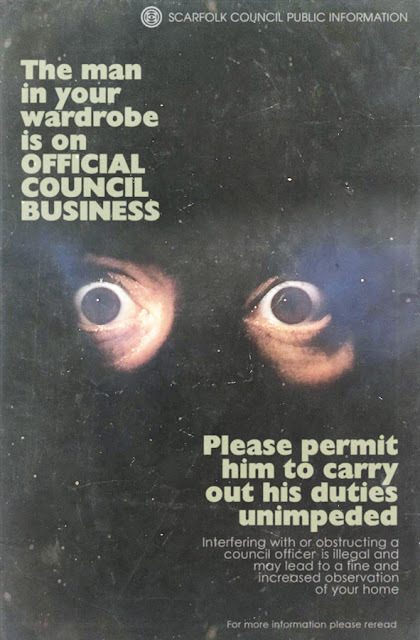 In 1973 there was an increase in complaints about odd, mumbling men appearing spontaneously in people's wardrobes. The council allocated funds to have them removed, but their efforts were in vain. No sooner had they expelled a 'wardrobe man' than another would appear in his place. Inexplicably, the men somehow found their way into residents' wardrobes regardless of how well doors and windows had been secured. When the council realised that the wardrobe men's whispered mumbles were detailed (albeit slowed down, backward) accounts of what they saw and heard from their closeted vantage points, it quickly registered the mysterious men as state employees. Once a week, local council workers recorded the wardrobe men's accounts onto wax reels, processed the audio in vast laboratories and prosecuted residents who contravened any of the local laws, which changed almost daily.